Pipe screw conveyors outer in round shape made from pipe containing inside helical spiral blade around a shaft. Pipe screw conveyor generally used for inclined conveying of material. Pipe screw conveyor can be provided with inlet hopper for intake of material. We are using high quality SKF / FAG make bearings for our screw conveyor for smooth & maintenance free operation. Hanger bearing also used for long screw conveyor where length of conveyor is more than 6000mm. We are also doing hard facing on tip of the inside Screw Blade / Auger to ensure better life of Screw Conveyor. We maintained precise gap between inside Screw / Auger and trough body for proper feeding of material. Inspection & cleaning door also provided in our screw conveyor for cleaning purpose. 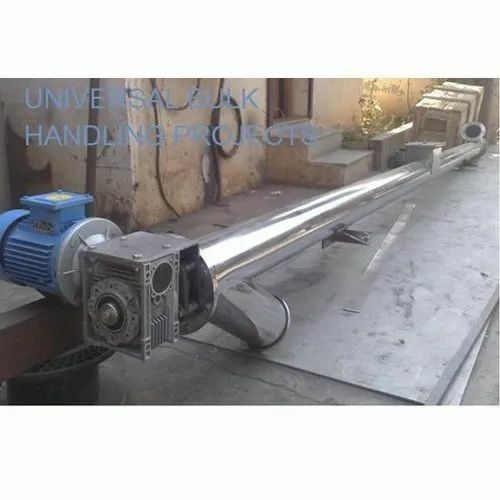 We, Universal Bulk Handling Projects started its journey towards excellence in the year 2010 are famous amongst the esteemed manufacturer, trader, and exporter of an exceptional quality assortment of Belt and Chain Conveyors. Offered products range consists of Belt Conveyors, Rotary Air Lock and Feeder, and Roller Conveyor. Manufactured making use of supreme in class material and latest technology, these are in conformism with the norms defined by the market.